The Granite desks make you stand a little taller, while the chic artwork lining the walls dares you to feel important. 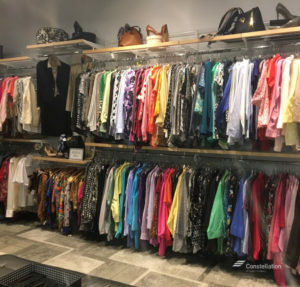 Director of Development, Anne McAllister, led the way through the lobby and into the “store” which holds walls lined with clothes, shoes, handbags, and accessories; a set-up any fashionista would be envious of. The scene was buzzing with women choosing the perfect professional attire for an interview or career fair. The air was heavy with excitement, gratefulness, and hope. However, it took less than five minutes to realize that there was so much more to this organization than clothes and suits. The beautiful building was opened in 2012, designed to give women the experience of a professional environment from the very first moment they arrive. Dress for Success Houston is the only affiliate to purchase land and build a facility for its members. Women referred from over 230 agencies are asked to arrive early or on time, to put their cell phones away, and to keep food and drink outside, in order to simulate an interview. The organization is comprised of thirteen elegant women handling multifarious tasks with equal aplomb. Each with a mutual respect for each other’s story and the unique talents that they bring to the DFSH mission. 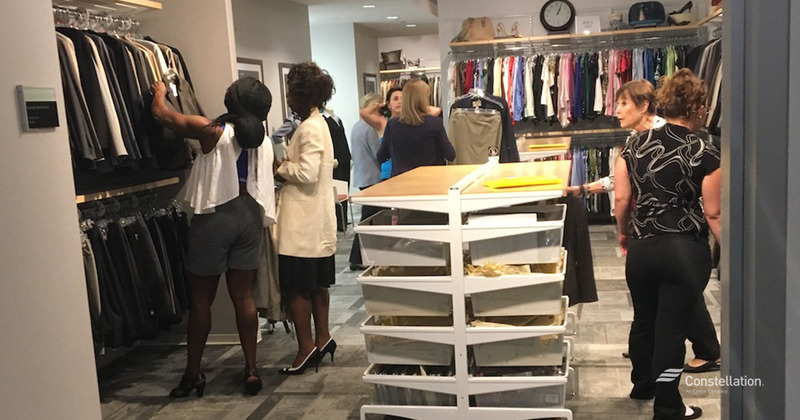 Dress For Success Houston has a mission to “suit” low-income women and provide them with the tools they need to be successful in a professional environment. This year, they hope to serve at least 3,500 women. However, this is a tall request for just thirteen women, so they rely heavily on the magnetic tenacity of their volunteers and interns. “The biggest misconception about us is that we just give women professional outfits to wear on interviews, but we’re so much more than that,” says Anne McAllister. In fact, they have designated hashtag #beyondthesuit to show just that. Not only does Dress For Success Houston provide each woman with a suit, shoes, a handbag, and a pearl set, but they provide each woman with a portfolio containing two pre-stamped thank you cards, bus passes, mock interview practice, classes on resume building/ linked-in/ financial literacy and much more. “The purpose of suiting a woman is to give her the confidence that she needs to walk into a professional environment and know that she is worthy of what is coming,” says Anne McAllister. She continues, “I have a quote hanging in my office from one of the woman that we served that says ‘Tears came to my eyes. This suit was a symbol of what I look forward to in my future. Looking back at myself in the mirror, I was a strong, independent career woman’ and that is so touching to me.” Dress for Success Houston gives these women more than an interview outfit, they inspire confidence and make sure that each woman knows her value. But perhaps one of the most touching examples of how DFSH goes above and beyond is their child watch program. Women attending meetings and classes have the opportunity to sign up their children for free babysitting. The child’s day will contain a lesson mirroring the lesson that their mom is learning. For example, during a class on financial literacy, the children were making piggy banks and learning the value of saving. DFSH not only goes #beyondthesuit, but they go #beyondtheuniform as well. Six days a year are dedicated to serving Veterans. Marine, and mother of four, Alesha Walker heads the program with a vivacious spirit. Having experienced exactly what these women are going through in her own life, Alesha’s courage inspires the veterans around her to take advantage of the resources offered at DFSH. With a humble confidence, she was able to grow the program from 63 veterans served in 2013, to now having a goal of serving 400 veterans in 2017. While Veterans spend their lives serving us and our country, when they retire or discharge from the military, they are left isolated and often times without the resources they need to help them transition back into civilian life. DFSH fills that void by offering a network of support and a liaison to bridge that gap between the military and the civilian workplace. Dress For Success Houston puts on several events each year the most recent being Cuisine for a Cause where nineteen local female chefs donate their times and talents to provide top-notch food. DFSH also participates in Chevron Houston Marathon’s Run for a Reason program, raising over $56,000 for the cause. Find these events, as well as others, here. Dress for Success Houston is an amazing organization with impressive statistics, but it’s also more than that. There aren’t numbers or words that can describe how many lives that these working women touch. When they provide a woman with the tools she needs to succeed, they are providing her daughter, her children, her family with an example, and the skills that they need to achieve as well. It’s the gift that keeps on giving. “We really appreciate that Constellation reaches out and wants to supports their customers,” says Anne McAllister of the Community Champions Program. Every year, Constellation gives grants to over three hundred nonprofits. Constellation is so much more than just an energy provider, #ConstellationCares. To apply for a community champions grant, click here. To donate to Dress For Success Houston, click here.